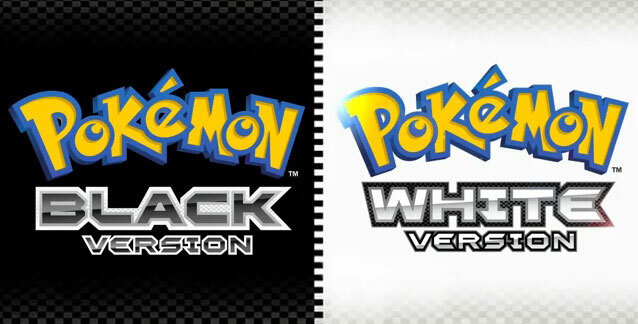 Pokémon Black & White are on sale at most major game retailers on the East Coast by now, and while those crazy Pacific Coast guys like me still have a couple hours of waiting for my copy, I guess that means the game’s fully and officially launched in the U.S. I’ll be doing a journal of sorts on my progress, with daily updates tracking the growth of my team and all the neat little things I discover while exploring Unova. Don’t expect crazy-fast progress since I’m heading into my last week of the term and will need to start hitting the books today as well. In other news, the “Passport to the Unova Region” event looks to have been a huge success. Press pics below. 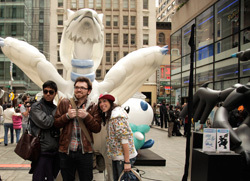 In this photo provided by Nintendo of America, Anwar B., 19, from Baltimore, Austen W., 19, from Jacksonville, Florida, and Lauren V., 25, from Cold Spring, New York, pose with larger-than-life inflatable Pokémon from the Pokémon Black Version and Pokémon White Version video games for the Nintendo DS family of systems at the games’ launch event in New York on March 5, 2011. 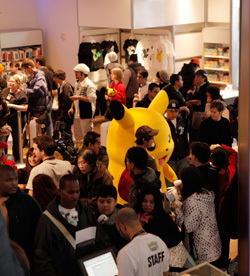 In this photo provided by Nintendo of America, Pokémon fans gather at Nintendo World in New York on March 5, 2011, to watch a live musical performance by The Presidents of the United States of America to celebrate the U.S. launch of the Pokémon Black Version and Pokémon White Version video games for the Nintendo DS family of systems. 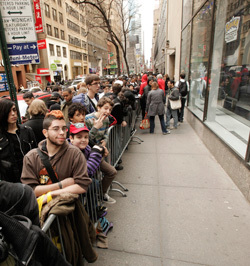 In this photo provided by Nintendo of America, Pokémon fans wait in a line of more than 10,000 at Nintendo World in New York on March 5, 2011, to be among the first in the U.S. to purchase the Pokémon Black Version and Pokémon White Version video games for the Nintendo DS family of systems. In this photo provided by Nintendo of America, eager fans wait at Nintendo World in New York on March 5, 2011, to be among the first in the U.S. to purchase the newest Pokémon video games: Pokémon Black Version and Pokémon White Version for the Nintendo DS family of systems. 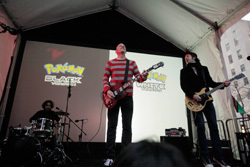 At the special launch event, attendees had the opportunity to purchase the games early and enjoy a live performance from rock band The Presidents of the United States of America. In this photo provided by Nintendo of America, Pokémon fans at Nintendo World in New York on March 5, 2011, work to complete their exclusive Pokémon Passport booklets, which took them through stations featuring game-play kiosks, new Pokémon displays, a Pokémon art gallery and more at the U.S. launch of the Pokémon Black Version and Pokémon White Version video games for the Nintendo DS family of systems. In this photo provided by Nintendo of America, a devoted Nintendo fan, Sarah B. 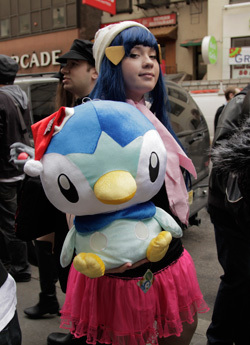 21, from Hide Park, New York, dresses in Pokémon gear and gather at Nintendo World in New York on March 5, 2011, to celebrate the arrival of the Pokémon Black Version and Pokémon White Version video games for the Nintendo DS family of systems. 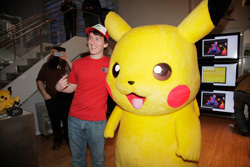 In this photo provided by Nintendo of America, David W., 24, from Chapel Hill, North Carolina, interacts with Pikachu at a Pokémon photo booth at Nintendo World in New York on March 5, 2011, to mark the U.S. launch of the Pokémon Black Version and Pokémon White Version video games for the Nintendo DS family of systems. 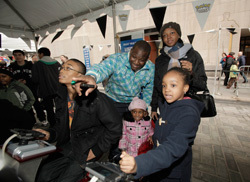 In this photo provided by Nintendo of America, the Antwand Pearman from Bronx, New York, and his family play the Pokémon Black Version and Pokémon White Version video games for the Nintendo DS family of systems at a Nintendo World launch event in New York on March 5, 2011.